Get Stuff Done With Toodledo | Brand On! Just when I thought it was safe to avoid trying yet another task management application, I got an email from Jake Olefsky, founder of Tooledo. After some virtual arm-twisting, Jake convinced me to try it out and gave me a premium trial account so I could report back on my experience. Keep reading until the end for a special discount code from Jake. After messing around with Tooledo for a bit, I can say it’s an impressive—and very affordable—system. Having admittedly been a Basecamp fan boy and lately gravitating to Asana, I am finding Toodledo to be one of the most robust and extensible platforms I’ve used. It’s packed with options yet fairly intuitive. It seems like an ideal GTD system for someone who likes a lot of control over tweaking their preferences. The best features include a raft of options for tracking the priority of events. These include tracking tasks by start date, due date, time, length or status—all of which are optional. 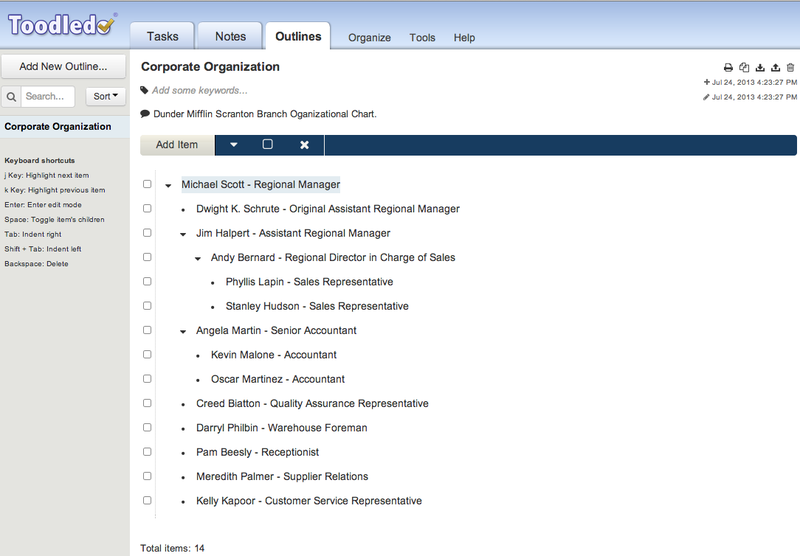 You can also set up and assign tasks to a folder, context or goal. 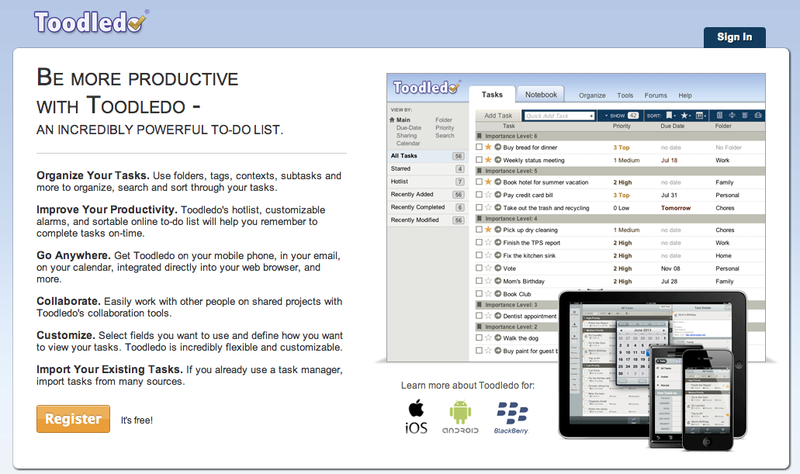 When you complete a task that contributes to one of your goals, Toodledo will keep track of it. You will be able to see the number of tasks you have completed for each goal, as well as visual representation of the goal’s chain. The chain gets longer for each consecutive day that you do a task that contributes to the goal. If you make progress on a goal each day, you will have a long chain. If you miss a day, that chain will get broken. This is a good way to motivate yourself to work on your goals. Contexts are another standout feature in Toodledo. These help you organize tasks by where you are and what you are doing. 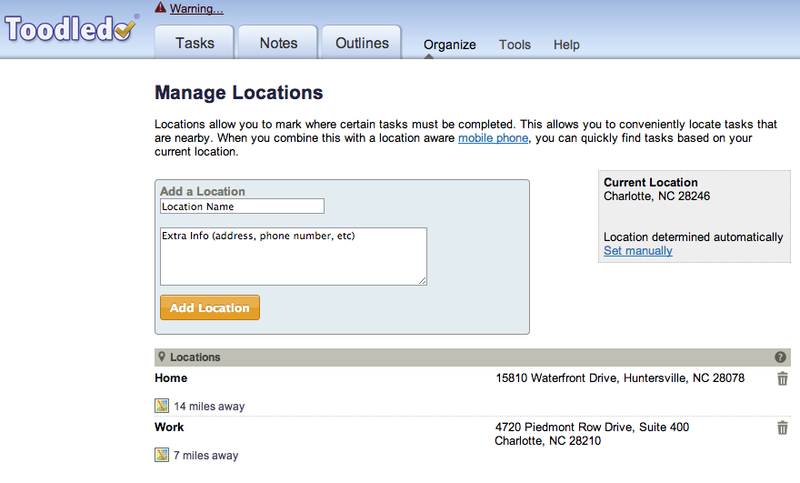 You can set up locations like Home, Office, etc., and Toodledo will literally find them using Google Maps. A Context filter for tasks will hide tasks that do not match your current location, so you can quickly see only those tasks that are important at the moment. Some commonly used contexts include: work, home, car, gym, etc. Outlines is their newest feature. As the name implies, it is a place to organize projects, take notes and store other hierarchical information. It helps that you can easily duplicate or download outlines as plain text files. A smart list that automatically figures out what’s important to you right now. If you have limited time to work on something, this will analyze the details of your tasks to determine the best use of your time. Very smart. Subtasks are a convenient way to organize projects and tasks that have multiple steps. These are designed to help keep your to-do list less cluttered. You can share a to-do list privately with other people. The other member must also have a subscription if you want them to be able to edit your list, otherwise it will be shared in read-only mode. They have apps for iOS, Android and Blackberry, along with integrations for about 50 other third-party apps. Cost: Free and paid versions. Normal pricing for premium subscriptions is $14.95 or $29.95/year—but you can get a 10% discount off a pro account by using the promo code brandon.